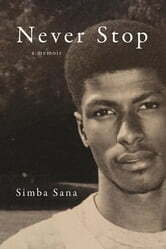 Never Stop is the wrenching memoir of Simba Sana, the cofounder and former leader of Karibu Books, a major indie-bookselling phenomenon and perhaps the most successful black-owned company in the history of the book industry. In this memoir, Sana reveals how his experience with Karibu jumpstarted his lifelong journey to better understanding himself, human nature, faith, and American culture—which ultimately helped him develop the powerful personal philosophy that drives his life today. Born Bernard Sutton in Washington, DC, Sana grew up in the cycle of poverty and violence that dominated inner-city life in the ’70s and ’80s. Sana’s academic success got him into college, where his life increasingly embodied the contradictions that plagued his youth. Committed to self-improvement and self-discipline, he grew into a successful businessman while becoming an impassioned Black Nationalist and Pan-Africanist. He lived the corporate life at Ernst & Young by day while leading radical consciousness-raising groups by night. Building Karibu became Sana’s opportunity to bind the disparate elements of his life together. Ultimately, though, the paradoxes in his identity and his accumulated emotional wounds confounded his effort to overcome his business reversals, and everything Sana built—his marriage, family, and business—was lost in an incredibly brief period of time. Sana had to rebuild his life—and his identity—and set out to do so in a way that focused principally on the meaning and importance of love.